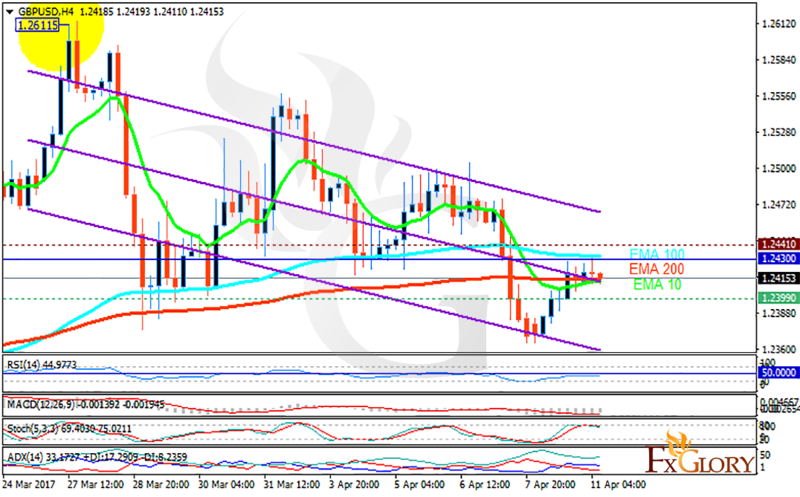 GBPUSD is chiefly under the influence of Inflation figures and J.Yellen’s comments. The support rests at 1.23990 with resistance at 1.24410 which the weekly pivot point at 1.24300 is located in between the lines. The EMA of 10 is moving with bearish bias along the descendant channel and it is below the EMA of 200 and the EMA of 100. The RSI is moving horizontally below the 50 level, the Stochastic is moving in high ranges and the MACD indicator is in negative territory. The ADX is showing buy signals. Considering the mixed signals of indicators, the resistance level breakout will smooth the way for further growth targeting 1.2500, otherwise it will drop to 1.2300.